The parents and wife of billionaire kidnapper Chukwudumeme Onwuamadike are now demanding to see him as a means to douse their fears that he may be dead after all. Saturday Sun had last weekend reported exclusively how Evans was moved out of his Lagos police command cell at midnight and driven to Abuja by about 30 heavily armed policemen. Though the police initially kept quiet following enquiries about the suspect’s whereabouts, they however officially confirmed our report the following day, that Evans had indeed been removed discreetly from Lagos to Abuja for further investigation. Following the clandestine movement and the furore generated, Evans family is now expressing doubts on whether he’s still alive and as a result demanding to see him while accusing the police of deceiving the public by dishing out mischievous and misleading information instead of carrying out thorough investigation on the suspect’s alleged misdeeds. 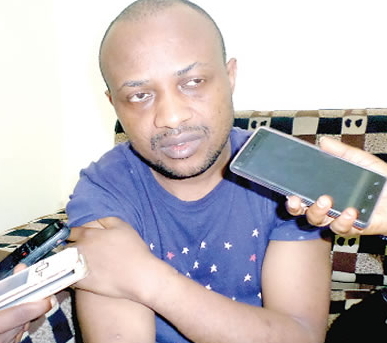 Speaking with Saturday Sun, Ogungbeje said the police went to obtain a court order to detain Evans for three months after he had already instituted a court action against his detention. He said: “The police are only playing the ostrich. Do you know as his lawyer, I have been denied access to him, do you know that the father, his mother, his wife and children have been denied access to him? “The police are not telling the truth. Why have they not published the court order they claimed to have got? Let them name the judge. They are only misinforming the public. They are not bold enough to publish the order. In short, they don’t have it. “The police have been mischievous. There is more to it than meet the eye. The matter is in court and we should allow the court to handle the case and wait for the outcome of the matter”. According to him, all the media attacks to stop him from representing Evans and his family cannot stand, while he urged the police to do a thorough job in accordance with the constitution, saying that, “we are not saying that we want to ensure that our client escapes justice at all costs. What we are saying is that we were given letter of representation and properly briefed and we have the claim to represent him within the confines of the law. While saying that the police are resorting to crude tactics because they know they don’t have any evidence to press charges against Evans, the lawyer challenged them to charge him and see how flat their case will fall. “He has been moved to Abuja. Someone that we did not have access to while in Lagos Police Command, how do you think that we will be able to access him in Abuja? The police keep on brainwashing him, they keep on threatening him, they keep on deceiving him. Take him to court, that is what the law says”. Who Is Funding Evans Legal Fight To Gain Freedom? What Happens To Billions In His 4 Bank Accounts? DIE HE MUST, if they kill him, then its ok and proper bcos he has committed so many death-deserving crimes. But what about the many innocent law abiding citizens of Nigeria and abroad he had remorselessly killed prior to his capture? I think the only reason the Nigerian police are still keeping him alive is because his cooperation is helping them a great deal in their investigations to round off his boys and partners in crime at large. In fact, they are supposed to have arrested all the members of his useless family and detain them all for them to understand the pains he had caused others during his reign of terror. Nonsense! Anyone who is interested about him is either after his money or trying to exonerate him/herself….For those on top who gave him cover or shared the money with him, don’t be surprise they are working to change his identity as far as he never mention their name, and they are likely to be using him further for operation because that’s his pure talent….his link is so powerful and operate fine with Nigeria set up. Lawlessness.